This genuine OEM Kia Spectra5 Cargo Tray is for the 5-door model. The 4-door model has its own separate tray. This is a skid-resistant rubber tray and is 100 percent guaranteed to fit your vehicle. The Kia Spectra5 Cargo Tray was developed with the mindset of keeping your car in perfect condition. You already invested in the car, and there are a great number of reasons to save your car's interior trunk space with the Kia Spectra5 Cargo Tray. It is the perfect accessory at protecting your interior carpeting from dirt, spills, oil or any other damaging conditions. 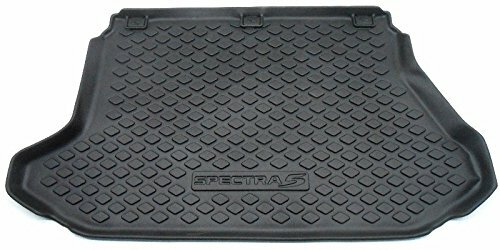 Additionally, the Kia Spectra5 Cargo Tray has raised outer edges that help to contain any spill within the tray itself instead of it leaking onto your carpet. The Kia Spectra5 Cargo Tray will fit the 2005-2009 5-door model years.